In December 2011 in Central China's Jiangsu Province, a picture posted on Facebook of a group of animal activists surrounding a truck that was taking dogs to slaughter. The activists ultimately paid about $8,000 to rescue the dogs that were taken to Ping An A fu stray animal rescue. What is this Ping An A Fu stray animal rescue? It was started in 2002 by founder Ms. Ha who started taking in strays off the street. Although she's was not a certified vet, she used to run a clinic at 32 Shanghai Lu that took care of basic dog needs. By 2006, she had taken in more than 300 dogs. 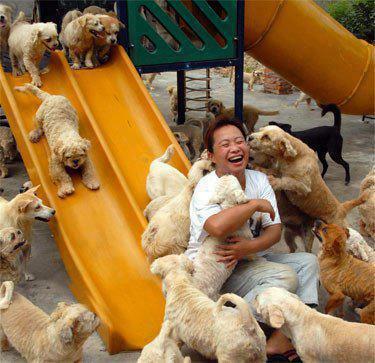 In 2007, a government initiative to address Nanjing's growing stray dog population compelled Ms. Ha to step up. The government proposed a culling; she proposed instead to take in more dogs. Recently Ms. Ha's organization made international headlines when she was forced to move all 1,500 dogs and 200 cats to a new shelter in Pukou, because of a government redevelopment project where the previous shelter was located. Now her movement to stop the dog meat trade is spreading quickly. The old, young and college students are joining her movement. The activists have begun stopping trucks along the highway carrying dogs to slaughter and then negotiating their release. Over the past year, animal lovers have stopped eight other dog-meat sellers along China's roadways and rescued an estimated 2,000 dogs. Where do these dogs go? If you would like to join the Ping An A Fu stray animal rescue click here.